Come on then Brighton & Hove Albion fans, are you Chris Hughton in or Chris Hughton out? Do you want him to be offered a new eight-year-contract and have the Amex Stadium renamed in his honour or do you want him fired immediately and paraded through the streets of Brighton and Hove so people can throw tomatoes at him? Judging by the reactions to Saturday’s humiliating 5-0 defeat to Bournemouth, you’d think that it was a binary choice between the two. In or out. Love or hate. Stay or go. When did the world become so black and white? With Brexit, probably. But here’s a radical idea. You can actually think that Hughton is doing a pretty terrible job at the moment and has been for several months, but not want Tony Bloom to give him his P45. 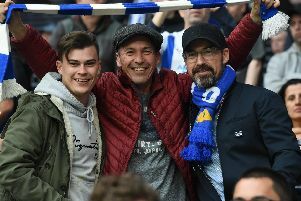 Only Albion fans wearing the most blue-and-white tinted of spectacles could say that the last four months have been acceptable. Eight points from 12 games since the turn of the year is form that gives a fanbase the right to question a managers future, even one who has built up as much credit as Hughton has in his four years in charge. If you take the Albion’s points-per-game average over the course of the second half of the season so far and apply it to an entire 38 game Premier League campaign, we’d be finishing with a total of 25. Given that Cardiff City have 28 this season with five games left to play, you don’t need me to tell you that since Big Ben struck midnight on December 31st, we’ve been in relegation form. Carry on like this into 2019-20 – presuming we survive this time around, of course – and we’ll be finishing very close to the bottom of the pile. Home defeats to Burnley, Southampton and that Bournemouth battering aren’t acceptable by any stretch of the imagination. Hughton has plenty to answer for. The change in December from a 4-4-1-1 formation to 4-3-3 has seen our points-per-game average plummet from 1.15 to 0.62; our goals-scored-per-game fall from 1.07 to 0.94 and our goals-conceded-per-game rise from 1.46 to 2.40. Everybody can see that the formation change has seen us score less and concede more – everybody except the one man who matters, it seems. A manager as clever and talented as Hughton surely can’t be deluded into thinking it is working when all the evidence says otherwise? Is he persevering with it out of stubbornness? To return to Brexit, he appears to have gone all Theresa May on us. 4-3-3 means 4-3-3, my formation or no formation. His substitutions continue to be a constant source of frustration. Why, at 2-0 down at home, replace one striker with another striker when that is surely the time to go two up front and chase the game? The Amex crowd certainly thought so if the boos which reigned down on the dugout when Florin Andone came off in a straight swap for Glenn Murray on Saturday were anything to go by. His game management also seems to be lacking. Once Anthony Knockaert gave the ball away to Bournemouth for their second goal and started doing his petulant walk where he sticks his chest out like a pigeon, it was pretty obvious that a dummy spit wasn’t far away. That should have been the time to haul him off before he was sent off. Instead, eight minutes later Knockaert took his frustrations out on the innocent Adam Smith by attempting to snap him into his pieces. Everyone in the stands could see what was coming and yet Hughton did nothing to prevent it. See you in three games time, Anthony. So yeah, the manager hasn’t been particularly impressive in 2019. Does that mean he should go? For me, not right now. There aren’t any better candidates out there for starters. But at the end of the season, a serious evaluation of where we are going could be needed. In a perverse way, you’d say if we get relegated, then Hughton has a better chance of keeping his job. Nobody in theory is better qualified to win promotion from the Championship than him, so if promotion is the aim of the game in 2019-20 then it would be foolish to get rid. If we stay up through default of Cardiff being worse than us though, you’d have to look at our second half of this season and say is Hughton the man to kick us onto the next level in the top flight? Or are we now stuck in a rut that is going to lead to a terrible 2019-20 campaign in the Premier League? There are plenty of questions to be asked and answered between now and the end of the campaign, but everybody would do well to remember that you can criticise Hughton but not want him sacked. Not yet, anyway.